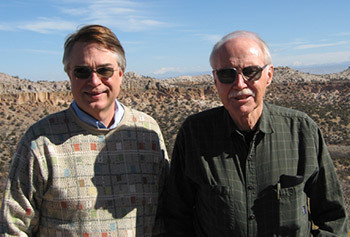 From left, Calit2’s Larry Smarr with Philip Smith in Santa Fe, NM, in 2006. Philip M. Smith, the founding co-chair of the California Institute for Telecommunications and Information Technology (Calit2) Advisory Board, passed away on February 16, 2014, after a brief illness. Smith was one of the most experienced science policy professionals in the United States, having served in Washington, DC during every administration from Eisenhower to Clinton. In the 1950s he trained as a geologist and conducted research in Greenland and Antarctica, leading to his directing large-scale international research programs in the geophysical sciences at the National Science Foundation (NSF) in the 1960s and 1970s. Smith later served as Associate Director of the White House Office of Science and Technology Policy (OSTP) for Natural Resources, Energy and Science from 1975 to 1981, working closely with Frank Press, who was President Carter’s science advisor and director of OSTP. Following this, Smith became Executive Director of the National Research Council for 12 years, where he continued his collaboration with Frank Press, the President of the National Academy of Sciences (NAS) from 1981 to 1993. Smith participated in many other public and private organizations, including as a member of the Board of Directors for Aurora Flight Sciences. In his role as Advisory Board co-chair, Smith worked closely with the UCSD and UCI Chancellors on strategic planning for Calit2. What made Smith so unusual was that, in addition to his 60 years in science policy, he was a perfect bridge between C. P. Snow’s “Two Cultures” of sciences/engineering and the humanities/arts through his lifelong engagement with both. As a collector and mentor of many contemporary artists, he developed a major personal collection. Later in life he began to give away large segments of his collection, for instance to found the Nampeyo :: Namingha – Tradition and Transition exhibit at the Museum of Northern Arizona. Smith was a great devotee of the theatre and made numerous trips to New York and London to see a wide range of peformances. As a result, he was a deeply insightful advisor to Calit2’s projects in the digital arts. Similarly, Phil Smith’s lifetime of outdoor adventures provided a unique perspective on Calit2 projects in the digital environment. In his early years Smith was active in cave exploration and mountaineering, and for five decades he was an avid river-runner on the Green-Colorado River System. In 1958, he conceived and helped plan the first and only successful upriver jet boat trip through the Grand Canyon in 1960. Smith shared these immersive experiences with Smarr and co-chairs of the Calit2 Advisory Board Forest Baskett and Anne Petersen in the “Friends of Phil” expeditions he led to the Grand Canyon in September 2007 (a two-week rubber raft trip down the Colorado river through 200 rapids) and on a National Geographic ship to the Galápagos Islands in July 2012.